In our daily lives, it is quite common to find elderly persons gradually developing swallowing problem or dysphagia when eating, so we always have to remind them to chew the food well and swallow slowly. Choking on food or liquids due to carelessness may cause aspiration pneumonia, leading to serious consequences. To prevent such situations from happening, there are a number of eating aids and utensils on the market to ensure the elderly eating safely and enhance their sense of independence. One may consider drinking cups with clear indication of the volume and control of liquid flow. This will enable caregiver to adjust the liquid level depending on the drinking speed of the elder, so as to eliminate the chances of an individual getting choked because of drinking too fast or having too much liquid in the cup. Drinking cups with large handles are ergonomically designed to enable the user to hold the cup safety with less chance for slipping when drinking. Some cups are fitted with a smooth cut on the edge to prevent the edge of cup touching the nose when drinking. 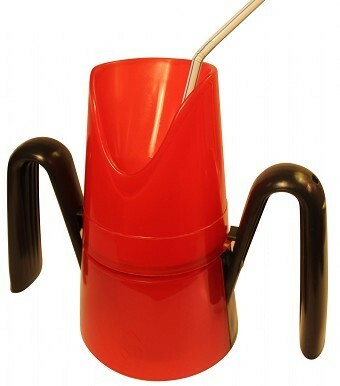 All the user needs to do is to raise the cup without tilting the head. It is particularly suitable for patients with dysphagia, limited neck movement, poor coordination or at risk of inhaling liquid. If the flexibility of elders’ hands is limited, they can consider using special utensils or handles which enhance the ability of self-eating. Easy to bend: the utensils can be easily hand-bent to the front or the back and to the left or right, so as to be positioned at any angle suitable for eating. Lightweight and heat resistant: compared with conventional utensils, the utensil has a non-slip and larger handle that is easy to grip and control. The handle is made of special silicone, lightweight, heat resistant and can be sterilized with high temperature. Special shaped shaft: the utensil has a contoured and textured handle that is easy to hold and use in any manner. Multi-function and non-slip tape: adding anti-slip pad on the handle will improve the supporting force and hand grasping force to prevent the utensil from sliding down. You can also add non-slip pads to the bottom of the dish or tray. To stabilize and balance the power of grip when eating, one may use one hand to grip the utensil and the other hand to grip the table handle. This is particular effective for persons suffering from trembling of hands, such as Parkinson patients. The table handle can be connected to any smooth surface in a simple manner.